With tape recorder in hand, Oscar Lewis documented the distinct voices of poverty among Native Americans, Mexicans and Puerto Ricans. He writes, "I believe [tape transcription] captures the full flavor of the speech of the people, the slang, the nuances, the hesitations, the laughter, the tears." Lewis first developed an ear for the human voice as the son of Herman Lewis, a rabbi, and Bertha Biblow. His graduate work in anthropology at Columbia University led him to Mexico, where he examined the lives of peasants and described them in his classic, Life in a Mexican Village: Tepoztlan Restudied (1951). In this pivotal study, Lewis formulated his theory of the "culture of poverty," which he described as "a way of life passed down from generation to generation." Going beyond impoverishment, the culture includes fifty-five traits of lifestyle, principles and perspectives of those living at the lowest economic levels. 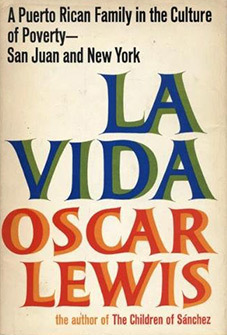 To test his theory, Lewis made several anthropological studies of the extended families of Mexican and Puerto Rican origin. He published transcriptions of these audio documentaries with his observations in Five Families (1959), The Children of Sanchez (1961) and La Vida: A Puerto Rican Family in the Culture of Poverty-San Juan and New York (1965). La Vida, a winner of the National Book Award, details the life of the members of the Rios family in extraordinary detail. The book, which does not represent all Mexican and Puerto Rican families, was hailed as "a work of art created by reality itself," and its portrayals of the poor "have an actuality, a vividness, and an impact that will reverberate in the mind." Lewis' three-volume oral history of the Cuban Revolution, Living the Revolution (1978), was published posthumously.